Enjoy reading blogs and exploring websites? I have a few favorite go-to sites. Some, I check on every day. Others I only go to when I have some time to kill. 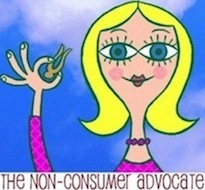 Here’s a short list of those Non-Consumer Advocate-friendly blogs and websites. No Impact Man : Colin Beavan spent the year 2007 trying to attain the goal of a zero-impact lifestyle. He did this with his wife and toddler in New Your City! (Not exactly your typical hippie-commune.) He is working on a book that will chronicle the experience to be published hopefully soon. Wasted Food: Jonathan Bloom writes this daily blog about issues surrounding the issues of food wastage. He is an entertaining writer, and is also working on a book. This blog is very informative and enlightening. I will first in the que to put this book on-hold at the library. Craigslist.org: Free online classifieds for everything, from free “clean dirt” to your next new house. It is simply the very best. Thing. Ever. I have offloaded the most enormous amount of excess household goods (a.k.a. — crap) through here, and made a pretty penny to boot. Warning — can be quite addictive. The Compact Yahoo group: This worldwide Yahoo group for The Compact, (buy nothing new) boasts 9000+ members, and is a terrific resource for just about any question you may have about living with less. You have to be a member to read the posts, but it’s free and ever so entertaining. I choose to not receive e-mails of all new posts, as that would be a flat-out insane number. I simply visit the site when I need my almost daily dose. The Simple Living Network: This website is a seemingly endless source of information on the simple living movement. From book recommendations to discussion forums, there’s something for everyone. Every time I go to this site, I discover something new. a family of four adults who produce 3 tons of food each year from their 1/5 acre plot in downtown Pasadena, California, and also keep goats and chickens and are otherwise incredibly self-sufficient. Their garden photo gallery is immensely inspiring, and always motivates me to go fit one more plant into my own very small plot. is the travel blog of 2 marine biologists who are sailing to Hawaii (on a raft made of 15,000 plastic bottles and part of a Cesna plane) to bring attention to the fact that there is no “away” to throw things to. Go non-consumers!!! Next post: Coin Girl To The Rescue!